Riviera has set the marine industry abuzz with excitement and anticipation after announcing an entirely new design of luxury yacht to usher in its astute and very advanced Sports Motor Yacht collection. Australia's most awarded luxury motor yacht builder - and 2015 Marine Industry Exporter of the Year - has revealed preliminary details of its pioneering 67ft yacht with a hull developed in conjunction with Dutch superyacht designer, Frank Mulder - three-time naval architect of the ‘Fastest Yacht in the World'. "Today we present a window to the future of Riviera," said the world-class luxury marque's chairman and owner Rodney Longhurst at the recent Riviera Festival of Boating and Gold Coast International Marine Expo, held on Australia's Gold Coast in May. "It is extremely exciting that we are charting a new course for Riviera that has for 35 years been a leader in design, luxury, technology and legendary blue-water sea-keeping performance." The 67 Sports Motor Yacht - scheduled for a 2016 release - is a refreshingly new design with sports performance and spacious sports-sized cockpit that will appeal to experienced luxury motor yacht owners who desire to spend more time cruising aboard a supremely luxurious, long-range Riviera. She will have a very versatile sports-styled cockpit with copious storage solutions to reflect her ultimate versatility. The mezzanine, being the heart of the entertaining space, will also feature a spacious dining and entertaining area, with direct access to the day head, as well as great connectivity to the central galley, of course befitting Riviera's hallmark alfresco lifestyle characteristics. This new-generation yacht from our talented international team of designers also offers a flexible accommodation plan with three or four staterooms with full-beam master stateroom, as well as options for a gym, teenager's retreat, crew quarters or a dedicated sporting equipment stowage. Riviera CEO Wes Moxey said the new Riviera Sports Motor Yacht's futuristic flybridge will be fully enclosed and can be accessed via an internal staircase, with an ultramodern forward helm brimming with the latest in marine technology and innovation. "We have developed this entirely new design after extensive consultation into where and how often our global family of owners who, in increasing numbers, are wanting to take their boating further afield with true long-range cruising," he said. "This unique and pragmatic design offers fantastic interior flexibility ... we feel our owners will appreciate the wide array of options to own a yacht with a uniquely personal touch and we are extremely encouraged by the feedback to our private presentations held during the Festival and at Expo." 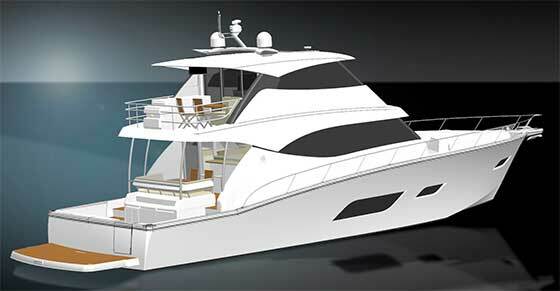 Mr Moxey also said the 67 Sports Motor Yacht will be shaft-drive and will feature a full stand-up engine room. "Tank-testing of the new Mulder hull is under way and the feedback we received here at the Festival was extremely encouraging," he said. "We've presented the preliminary designs to several owners of our larger Riviera flybridge models ... and they've given her great praise indeed." Riviera is pleased to report that the first two 67 Sports Motor Yacht models were ordered even before the end of the 2015 Riviera Festival of Boating. "That gives us great confidence that we are heading in the right direction with this new collection and model," said Mr Moxey. Riviera - the 2015 Australian Marine Industry Exporter of the Year and Australia's most awarded builder of luxury motor yachts - currently offers 18 different models from 36 to 77 feet across five model collections: the supremely seaworthy Flybridge range, stylish and sophisticated Sport Yachts, the sporty and adventurous new SUV series, the luxurious and long-range new Sports Motor Yacht design, and the timelessly classic Belize Motor Yachts.